MILAN, Italy – Cold brew, nitro and speciality coffee. Mono-origin and alternative brewing methods. The coffee universe is continuously evolving worldwide with new trends and types alongside the traditional (and timeless) espresso. This what visitors to Sic Salone Internazionale del Caffè, the time-honoured event in the scope of HostMilano (fieramilano from October 18 to 22, 2019) will be invited to discover. 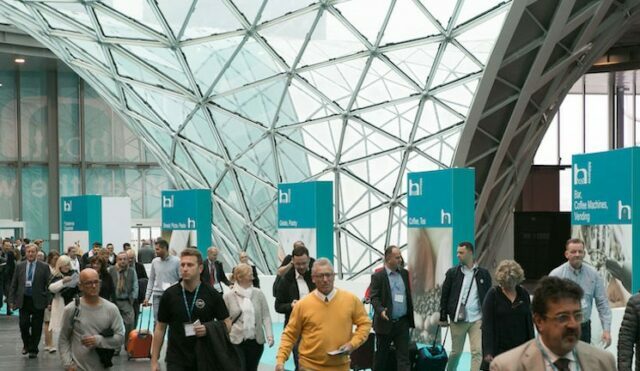 With six months to go before opening, the leading event in the HORECA sector can already count on the presence of 50 countries, for a total of 1,653 companies, of which 949 (57.41 % of the total) are Italian and 704 (42.59 %) international. The world of coffee and of its many expressions is preparing to be the star in the booths of FieraMilano attracting all the most important companies of the sector and hosting a packed calendar of events, contests and training activities designed to offer the most complete global overview on trends and characteristics of the coffee in the Third Millennium to bartenders and insiders. Everything that revolves around coffee is in full health in Italy and nearly everywhere in the world as confirmed by the Ulisse Information System. World trade in the Coffee – Coffee Machines – Vending Machine industry reached a new peak in 2018 with total in excess of EUR 17 billion (the average increase over the current decade is close to 10% a year). What is more, growth prospects for the sector as a whole are good for years up to 2022 (+6.1% average per year in Euro). Particularly in good health are the Premium-Price segments (this market share rose from 11.2% to 25.7% of the world total in 2008-2018 period) and those of Medium-High range, which increased by almost 7 points with respect to ten years ago. On world level, exports are driven by the high-added-value import demand of countries such as France, the United Kingdom, Germany, Holland, Spain, Canada and the USA, with newcomers China and Hong Kong, South Korea, the United Arab Emirates and Australia. Main exports from Italy in the sector – which totalled EUR 2.7 billion in 2018, confirming Italy as global market leader in Premium-Price exports and specifically in the vending machine segment – are especially Germany, France, the United States, Russia (on the rise), the United Kingdom and Austria. Speciality coffee and alternative brewing methods are becoming more popular in Italy, too. This year, coffee production will not be a problem. With Arabica more abundant that Robusta, coffee bean production will exceed roasted bean consumption (which is estimated to amount to 165 million sacks) on global level. On the contrary, experts say that the problem may be in the prices, always too low, according to a trend that started already in 2018. In terms of consumption, instead, the new frontiers of speciality coffee and of alternative brewing methods are gaining popularity in Italy, alongside the immortal espresso. This is certainly due to the arrival of a giant as Starbucks, but also of increasingly greater numbers of bartenders able to offer different products, not unlike sommeliers, and present the intrinsic qualities of each suggestion to their customers. This is also merit to the famous “Third Wave”, that by introducing single-origin product and ethical sourcing has changed the perception of the world of coffee. Starting from the increasing attention to sustainability (such as disposable pods made with recyclable materials and the use of increasingly green technologies) or by the search for products which are always unique and original. How? By using tools such as certifications, attractive packaging, attraction locations and, of course, cups with customised shape, thickness and capacity. Because having exclusive models in relation to different types of coffee and to the beverage preparation methods is one of the factors which can make the experience for end consumer truly unique. What will be the must-havesfor the next summer? Firstly, cold brew coffee. Neat or with coconut milk, almonds milk, tonic water, juice or Chinotto, it is the ideal base for mixing alcoholic or soft drinks. It is preferred with respect to shaken coffee for its simplicity and lack of sugar, in addition to its unmistakable aroma. Not less on-trend will be nitro coffee, that has won over consumers in the United States and northern Europe and Asia and which is preparing to land increasingly massively in Italy, too. With a thick creamy surface, not unlike a stout beer, it promises to be the ideal preparation for becoming the most popular beverage during warmer months, thanks to its freshness and its thirst-quenching properties. For all coffee professionals, Hostmilano means the latest news from the most important companies worldwide, but also the possibility to explore the new trends which identify the most innovative products. This is also thanks to SMART Label Host Innovation Award, a competition organised by Fiera Milano and HostMilano, in partnership with POLI.Design (Milan Polytechnic Consortium) and sponsored by ADI (the Italian Association for Industrial Design). A pool of international experts will evaluate and choose the products, services and projects that stand out from all others in terms of functionality, technologies, environmental sustainability, ethics or social implications. Trends, training and contests. In addition to presenting the intrinsic qualities of coffee and its brewing methods, Hostmilano will include a packed calendar of events and seminars in the booths of fieramilano to see the best professionals on national and international level at work up close. The Gran Premio della caffetteria Italiana, with the best Italian Bartenders selected during the year in five stages from the north to the south of the country will be in the spotlight. The Latte Art Grading Battle Championship, presented by AICAF Italian Academy of Coffee Masters and ALTOGA, the Italian National Association of Coffee Roasters, Importers and Food Wholesalers, on the other hand will focus on certifications. The Latte Art Grading System represents the only international certification system of its kind and present today in 22 countries of the world. Last but not least, will be Coffee Addition, presented by Gianni Cocco, AICAF Italian Academy of Coffee Masters and ALTOGA, the Italian National Association of Coffee Roasters, Importers and Food Wholesalers. The format, within Host 2019, will be held across various stands that will sign up for this initiative and for which a seminar (“master”) will be organised. The objective is to involve customers in an explosion of news related to the “mitigation” world, which in this case will be that of coffee. Apulum Porcellane S.A., Azkoyen S.A. Hanseatic Tea Export Gmbh, Astoria, Bianchi Industry, Bunn-o-Matic Corporation, Cafes Novell, Caffe’ Carraro, Caffe’ Mauro, Carimali, Cesare Trucillo, Colombian Coffee Growers Federation, Covim, Danesi Caffè, Dical Lollo Caffè, Diemme Caffè, Eversys Ag, Essse Caffè, Evoca Group, Flo, Franke Kaffeemaschinen Ag, Gruppo Cimbali, Harney and Sons fine Teas, Hausbrandt, J.T. Ronnefeldt KG, Julius Meinl Industrieholding Gmbh, Kimbo, La Marzocco, La Spaziale, Le Piantagioni Del Caffè, Manuel Caffè, Marco Beverage Systems Ltd, Rancilio Group, Rex-Royal Ag, Saquella 1856, Simonelli Group, Slayer Professional Espresso, Thermoplan Ag, Torrefazione Caffè Gourmet, Torrefazione Monforte, UCC Europe, Vergnano Caffè, Wega Macchine Per Caffè.